As told by his mother Marlo. I've always been afraid of hospitals. I hate needles. Nothing terrified me more than the idea of childbirth. My husband is the same way. But when I got pregnant in May of '09, after my first OB appointment and nifty ultrasound, we resigned ourselves to the idea that we would wind up at the hospital when the time came for me to deliver. On my 2nd OB appointment, she asked me, "So are you interested in going all-natural? It made me feel better to think that a doctor was basically telling me that I could do it without all the scary stuff. My mom, an RN, had already scared me shitless about the whole process and I was filled with dread. 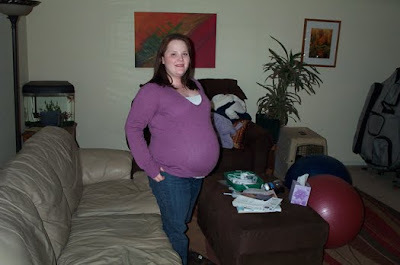 In my hormonal anxiety, I started "researching" natural childbirth. I watched the Business of Being Born with my sister-in-law and decided that it would be fine for me to go with a midwife since my doctor told me I was "healthy enough" that I should be able to "go all natural." That movie and all my internet reading suggested that home birth was a perfectly safe thing to do for healthy, low-risk women like me. My husband was on board, too. The first group of midwives I hired were all about homeopathy, strange diet changes, and harping on people about their weight. They stressed me out tremendously, but I stayed with them because they understood the importance of all the prenatal tests, and I was able to go to the DLO (diagnostics laboratory of Oklahoma) to get all my testing done and paid for by insurance, and a local OB (who I found out later is quite quack-tastic and pretty shady) allowed these midwives' clients to come and do their ultrasounds at his office. The midwives themselves, however, being CPMs, were not covered by insurance. They offered me a "discount" for paying in full before 35 weeks. The total fee after discount was about $2000. And in the end, I decided to change to a different midwifery practice because these CPMs were just too intense and I was having doubts... but of course, I wasn't refunded any money. So long about 34 weeks, I hired my final set of midwives. I was in love with them-- every time I went, they told me I was beautiful. They seemed so knowledgeable, and had a huge library of books on natural birth, spirituality, and other topics which seemed interesting to me at the time. I was comforted by knowing that the lead CPM (her assistant was a DEM) had been in business for over 20 years. I figured she must have seen it all. They told me that they only had to transfer 5 or 6 women a year, so surely I wouldn't need to transfer, and the hospital they transport to was nearby and they claimed that they had a "good relationship" with the doctors and CNMs there. I still had no idea just how different CPMs and CNMs really were, and I had no idea that they were lying about having a working relationship with this hospital. The DEM thought that I needed a rest at about the 30 hour mark (my hubby's estimate-- I was living out of time as we know it at this point...). She suggested that taking a benadryl would help me nap, and a drink would relax the uterine muscles and make the contractions space farther apart and lessen in severity. My husband didn't know any better, and despite my doubts, I took a benadryl with a chaser of TGI Friday's mudslide mix. My doula finally suggested the next morning that I get into the pool of warm water because I was completely distraught and she thought that it might alleviate the pressure just long enough to make some decisions about how to proceed. It had been about 48 hours, the DEM checked me and I was only at 1cm and change, but I was 60 or so percent effaced. Something was wrong, but she dismissed it at the time. I was delirious; neither my husband or I had slept (the DEM had taken a nice nap on our couch, however!). The DEM cavalierly said, "I had a 40 hour labor with my last child. It sucked, but you just have to get through it. The only way out is through. This is what gets your baby out." I will never forget that as long as I live, how dismissive she was about my pain, fear, and exhaustion. I sobbed as I sat in the water, wearing only a tank top. My doula rubbed my shoulders, and began to explain to me how epidurals work, giving me the courage to shout, "I NEED HELP!!!!!!!!" and giving my husband the nerve to say, "We need to GO." The DEM agreed, reluctantly, and despite her promise to drive us there herself, she decided she needed to stop at her house first and had us drive ourselves. When we got to the ER, the attending doctor was very brusque with me, slapping me on the back in the middle of a contraction and saying, "You're not in labor-- these are pregnancy symptoms. Get used to it." The MW came in with us, but she said nothing. She handed over my "records" which of course made no sense to a real medical professional. The resident doctors knew something was wrong, they lobbied for me to be admitted for augmentation for failure to progress, they saw I was exhausted... but since my BP and heartrate, and Sheppard's heartrate, were stable, their protests fell on deaf ears with the attending. He discharged me and gave me Ambien. 1. Jeremy called the DEM who came back when I reached 9cm, and was there through the delivery (30 min. of pushing). 2. Sheppard came out, they laid him on my chest for a moment-- he was beautiful, and smiled up at me. 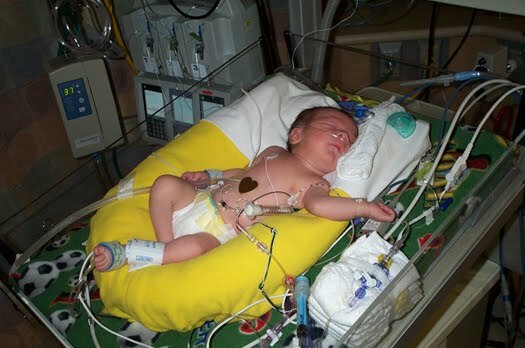 Then the neonatology/pediatrics team gently picked him up and said to me, "we need to help him now..."
4. 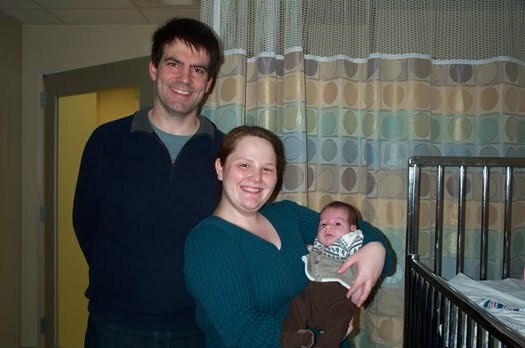 Sheppard was taken to the NICU, but rather than being observed for a few days, he suffered there for a month. One of his lungs collapsed, necessitating a chest tube, he went into PPHN necessitating countless heart echos to monitor the wonky valve, he had: chest tube, UAC, UVC, PICC line, IV antibiotics/antivirals/nutrition/fentanyl and sildenafil ("viagra"), oxygen and NO2, and he was on a ventilator for 2 weeks. 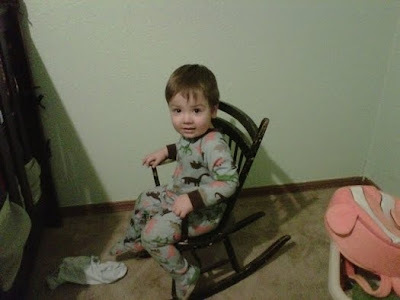 Still, he had the strength to roll a bit to the side whenever we came into his room-- he recognized my voice and wanted me to pat his bottom and rub his back like I did when he was in my tummy (he'd press his little bum against my belly to have it patted!). He was given a 50/50 chance. His doctors were amazing, though, and made us feel like he was a top priority for them. His nurses were wonderful. They sent every clergy-person (from every faith!!!) to our room to pray for Sheppard and sit with us. I will never forget the words of Dr. W the neonatologist-- "These little ones can turn on a dime. They can bounce back from almost anything, so please don't give in to despair-- there is every reason to hope. None of them blamed us at all for what happened. We had Sheppard baptised and he had the Annointing of the Sick. 5. my parents blamed us for the whole thing, causing another layer of pain and drama... it didn't help that the ER doc that saw me on the first trip there was skulking around my room and telling them things like, "if these girls wouldn't try this homebirth stuff and work with midwives, these things just wouldn't happen... they bring it on themselves..."
8. 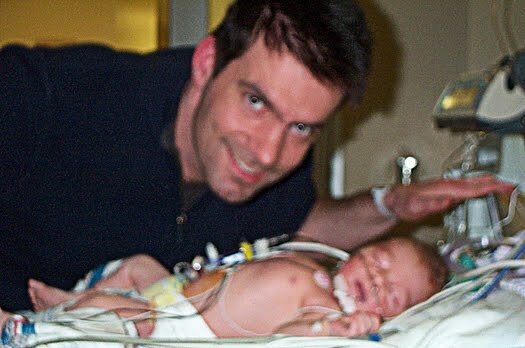 I realized more and more that the cascade of catastrophe began with the failure of the midwives to recognize that something wasn't right in labor, failure to consider the estimated size of my son from the ultrasound I had at 34 weeks, failure to get me help sooner... the DEM had the nerve to say to me, when I went to them a few months later to talk about what all happened, she said, "Hopefully next time you'll trust birth more, and it will go easier." UGH! 9. Recently I wrote a FB email to the CPM who never showed up, and she wrote me back an ugly series of notes accusing me of slander, harassment, of being crazy and "changing the story in your mind," and saying she would take legal action against me if I "continued to slander" because she would "defend" her "reputation of safety." 12. I'm SO GRATEFUL to our amazing medical team, to my husband who stood by me, to Dr. Amy and all of you for giving me the permission to embrace what really happened and stop blaming myself for everything when I really had no control over it once it started and the mw's dropped the ball. Had I stayed with an OB the whole time instead of hiring a CPM (and then getting stuck with a DEM), all this might very well have been avoided entirely, or at least rendered not-as-bad. I trusted those midwives to act in my best interest, to recognize any problems before they went critical, to be there for me... but they don't have the knowledge or training to do that. I know that now. Hurt by Homebirth has been created as a safe place where women can tell the stories of the babies who died or who were left injured by homebirth. This is not a debate board, but we will try to provide sources to research papers and other accurate information on the death toll of homebirth, as well as newspaper accounts of homebirth tragedies. If you have a story to submit, you can send it to DrAmy5 at aol dot com. Please include a picture or pictures if you can. Babies who have been hurt by homebirth should be seen, literally, so everyone can understand that each death represents an unimaginable tragedy for the babies who never had a chance to live, and for the families who will mourn them forever. The babies who have died at homebirth will be hidden no more. Add the badge above to your website.